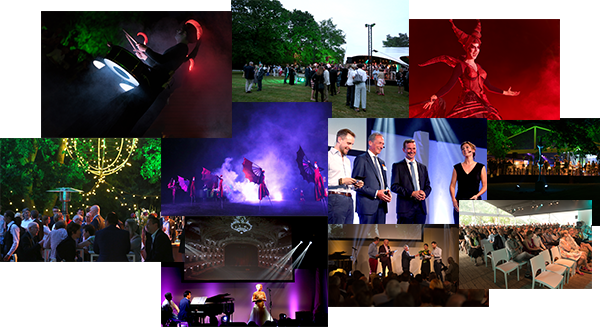 The 25th of May marked a special day in our agenda this year. With great festivities, we opened this year’s Art in the Park exhibit, where we showcase impressive works of art by renowned artists. This year, our collection includes sculptures, sketches and more from the likes of Fabre, Panamarenko and Wim Delvoye. With such an inspiring environment, it was a given that we’d also celebrate twenty years of INNOCOM at the same time. The night was filled with spectacular performances. Opera singer and laureate of the famous Queen Elisabeth competition Iris Hendrickx took to the stage, a street theater put on their best show and on-lookers were amazed by a sensational fire show. What really made the night for us, were all our guests that contributed to the amazing atmosphere of the event. From clients over partners to art enthusiasts, we want to thank each and every one of you for celebrating our anniversary with us and for the faith you have put in us in the past twenty years. And we’re looking forward to keeping that trust for the twenty years to come! We’re committed to innovation, but most of all we’re committed to you!